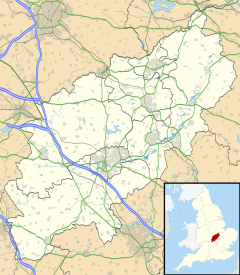 Church Brampton is a village in the Daventry district of the county of Northamptonshire in England. Together with nearby Chapel Brampton the two villages are known as The Bramptons. At the time of the 2001 census, the parish's population was 251 people.At the 2011 census the population was included in the civil parish of Church with Chapel Brampton. Its church, St. Botolph's, dates back to the early 13th century. Just outside the village are two golf clubs, Church Brampton's Northamptonshire County Golf Course and the Brampton Heath golf course, a public course. Wikimedia Commons has media related to Church Brampton. This page was last edited on 12 February 2019, at 12:00 (UTC).